To repair wired doorbell buttons, remove the two screws on you doorbell button. There should be two wires attached to the back. If you don't see wires, you have a wireless unit. See the article 'Wireless Doorbell Repair' for more information. Faulty wires or the button itself are the culprit most of the time. For related wired doorbell articles, see the article 'Fixing Wired Doorbells'. Are the wires loose or corroded? Yes, then turn off the power and clean them up or tighten them. Does the doorbell work now? Yes, great, your done fixing your wired doorbell button. No, shut the power off and then unhook them from the button and see if the doorbell sounds when you touch the two wires together. Turn the power back on to do this. Does it work? Yes, then the button is bad and needs to be replaced. Obtain a new wired doorbell button and attach the two wires to it and screw it back onto the door jamb. Still not that hard, right? Another issue with a wired doorbell button would be a doorbell that rings constantly. A sticking doorbell button is usually to blame. The button itself might need to be replaced. Turn the power off and unhook one of the wires from the button. Turn the power back on and see if it stops the ringing. Yes, then it is the button. Get a new one and replace it. No, then it is a short in the wiring. Check the wires for cracks or missing insulation. Repair as needed. 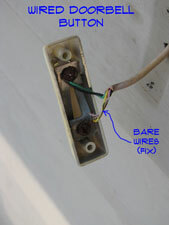 Fixing a wired doorbell button will likely involve corroded and broken wires. On occasion the switch inside the doorbell button goes bad. The first thing to do is remove the two screws on you wired doorbell button. There should be two wires attached to the back. Faulty wires or the button itself are the culprit most of the time. Are the wires loose or corroded? Yes, then turn off the power and clean them up or tighten them. Does the doorbell work now? Yes, great, your done with your doorbell repair. If you don't see wires, you have a wireless doorbell unit. The article 'Fixing Wireless Doorbell Buttons' will give you some instructions on this issue. If this does not work then it is a short in the wiring. Check the wires for cracks or missing insulation. Repair the wires as needed. This will only work if the wires are visible. For broken or corroded wires that are hidden you will have to make a choice. Trying to fix or replace the wiring may be too big of a job to tackle. See the series of articles on 'Doorbell Wiring' for more information. The other choice would be to replace the doorbell with a wireless doorbell. See the articles on 'Replacing Wireless Doorbells' for guidance.